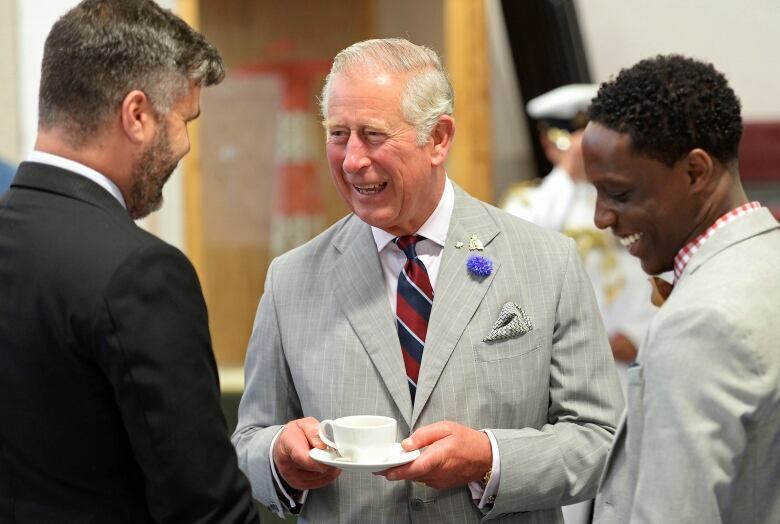 Retired master corporal William Hawley had been anxiously awaiting the chance to meet Prince Charles and thank him for the Prince's Operation Entrepreneur program, a course that helped him transition from military life to life on the farm. When retired master corporal William Hawley met Prince Charles on Friday, it was a chance to say thank you — and to talk a little turkey. Hawley is a graduate of the Prince's Operation Entrepreneur program, one of Charles's charities in Canada that helps veterans transition to civilian life. In Hawley's case, that transition has led him from the battlefield to the farmer's field — his own organic poultry and vegetable operation. Hawley and his wife, Carolyn Guy, were among the beneficiaries of the program who met the Prince of Wales and Duchess of Cornwall in Trenton, Ont., during the royal couple's three-day tour of Canada that began Thursday in Iqaluit. "Well, I said the proper greeting, 'Hello, your royal highness,' and then he said, 'I hear you're doing marvellous things with turkeys.' Which immediately knocked me back," Hawley told CBC News after the meeting. Hawley served in the military for 30 years and was deployed on a tank regiment on two overseas tours, one in Bosnia in 1994-95 and the other in Kosovo in 1999-2000. The tank caused damage to his body, and the job took a toll on his mental health. "I have mental issues that any normal and compassionate human has when they see what we see," Hawley said. He was medically released in February 2016, with physical injuries that included a compressed fracture in his spine, carpal tunnel syndrome in both elbows, a dislocated shoulder and separated collarbones. Hawley describes the lead-up to his release as "terrifying and unnerving." Always serving in the junior ranks, he was used to taking orders rather than drafting plans. "I was never in that planning phase to create a plan, so now I have to create a plan for the rest of my life," Hawley said. "So that part was really nerve-racking." Hawley decided his next career would be in organic poultry and produce farming. But he knew he couldn't pay the bills on vegetables alone. He stumbled onto the prince's program, applied and got accepted. Then he began training in a new type of boot camp. The charity provided Hawley with an accelerated business course at the University of Regina, which taught him how to make his farm near Metcalfe, Ont., more than just a hobby. He learned how to get a business licence, build a website and register his farm's name. Most important, it gave him the confidence he needed to transition to his post-military career. "One of the things that really drags you down when you've got mental luggage from the army is, 'What's the point? Why bother? Nobody cares.' And I'll tell you, that week [it felt like] everybody cares," he said. The program was created in 2012 and since then has helped 1,500 people determine if becoming an entrepreneur is a good career choice. 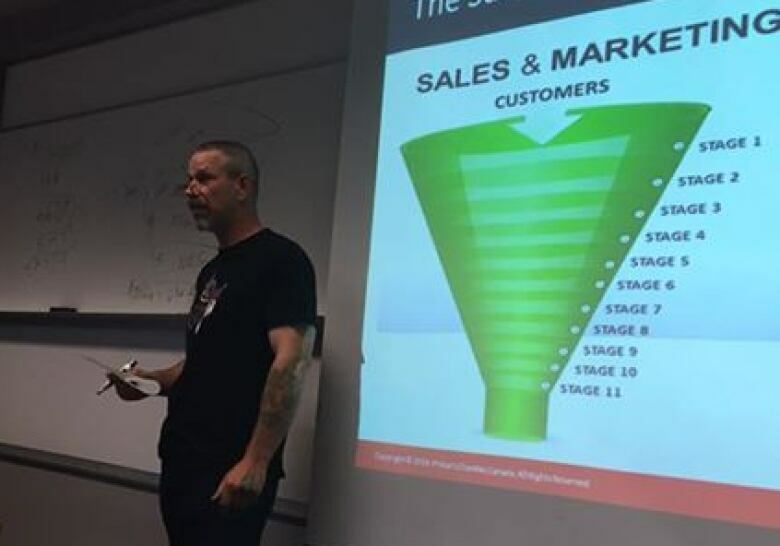 Hawley takes part in the Prince's Operation Entrepreneur program, funded by Prince's Charities Canada, to help veterans transition to civilian life. Royal historian Carolyn Harris, author of Raising Royalty: 1,000 Years of Royal Parenting, said Charles will be delighted to know he is making a difference in veterans' lives. "Sometimes when the public thinks of the Queen or Prince Charles, they think of the British Royal Family, whereas when they see members of the Royal Family engaging with Canadian military regiments, undertaking philanthropic initiatives in Canada, this gives the public a sense of how this is Canada's Royal Family," Harris said. For Hawley, that connection with Charles is now personal. "I know he's not sitting in his house at night saying, 'Gee, I wonder how William Hawley's farm is doing?' But by the same token, his endorsement and belief in the program is kind of like a belief in me," Hawley said.